If you’re a registered nurse thinking about changing careers, you’re not alone. A national study by RNnetwork showed that half of all nurses considered leaving the nursing profession in 2017. Working nights and weekends is increasingly difficult. You like healthcare but feel overworked in direct patient care. You want to use your experience and knowledge to streamline healthcare processes and improve care on a larger scale. Your goal is to advance to a leadership role and increase your salary. If any of these are true, one alternative career to consider is health information management (HIM). In the past two decades, HIM has transformed into the largest healthcare department not directly involved in patient care, and nurses are well positioned to transition to these roles. 1. HIM jobs are plentiful and in high demand. 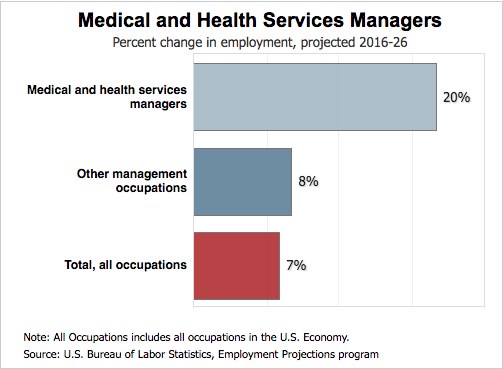 The healthcare industry as a whole is seeing increased demand for medical services—and medical personnel. This, of course, includes HIM professionals. Widespread use of electronic health records will continue to create demand for managers who can organize, manage, and integrate these records for all healthcare providers—be they large or small organizations, long-term care facilities or hospital systems. Job titles and specific duties of HIM professionals vary considerably. With an advanced degree in HIM, RNs are qualified for many of the roles, including nursing informatics specialist, clinical documentation improvement (CDI) specialist, and healthcare administrator. 2. The HIM department offers a predictable work schedule and environment. One of the most common reasons RNs change careers is to gain more control of their work hours. In fact, nearly half of the nurses polled for the RNnetwork study said their current jobs didn’t support a healthy work-life balance. For others, like UW graduate Heather Smith, the physical demands of nursing become challenging. Overall, HIM staff enjoy more consistent schedules and less physically-demanding work environments than those in clinical roles. HIM professionals tend to work nine-to-five schedules in office environments within healthcare institutions or from satellite locations. More and more HIM departments are virtual as well, with some staff working remotely. 3. Your knowledge of direct patient care is valuable. Nurses work “on the floor.” HIM professionals work mostly behind the scenes, serving as a critical link between providers, payers, and patients. They collaborate with physicians, nurses, case managers, chief financial officers, and others to ensure that patient information is complete and accurate. You might think that having experience in medical coding or health IT is the best background for HIM. However, you know how medical processes play out “on the floor” and how organizational structure and overall patient care can be improved. That’s huge. This knowledge will help you succeed in any HIM job. For example, in the role of healthcare analyst, your understanding of care delivery might guide your data analysis and help you discover the most effective strategies for improving the patient experience. 4. You’ll have more growth opportunities and possibly receive a salary bump. The national average salary for RNs is $70,000, according to the U.S. Bureau of Labor Statistics. The latest AHIMA salary survey showed that HIM managers earn an average of $78,020. Director-level HIM professionals make an average of $96,050. Having an HIM education will give you an edge when applying for HIM jobs—and help you move up to high-level leadership roles, if that is your goal. 5. You can drive technological innovation in healthcare. Technology is transforming clinical workflows. If the idea of driving this tech innovation invigorates you, the fields of nursing informatics and health IT—which is closely connected to HIM—is another option to consider. In tech-focused roles, you build and manage the systems used by HIM professionals and clinical staff. Again, a background in nursing is an asset for these positions, since you know first-hand how technology can help or hinder work done on the floor. Plus, health IT professionals in leadership roles tend to make more than $100,000, according to a 2018 HIMSS compensation survey. The University of Wisconsin online Bachelor of Science in Health Information Management and Technology offers two curriculum tracks in HIM and health IT. Students can choose to specialize in one or both. Unsure of whether HIM or health IT is the better fit for you? Learn more about the HIM and health IT tracks. Discover what you’d learn in UW HIMT courses. See an overview of the online bachelor’s degree completion program. Or, contact an enrollment adviser at 1-877-895-3276 or learn@uwex.edu with any questions you have about the program. Perhaps, you are still weighing your options. You can stay in nursing and advance your career as well. Learn more about the online, self-paced University of Wisconsin Bachelor of Science in Nursing offered through UW-Milwaukee.